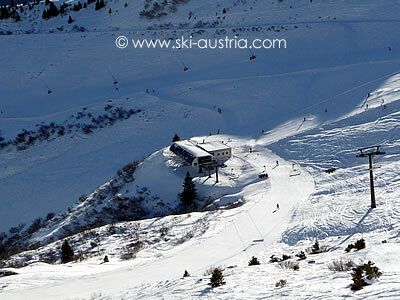 Bad Hofgastein's ski area is a good-sized intermediate area across the main valley road from the main village with a selection of cruising red and blue runs mostly located on open slopes. There are some lengthy runs down into the trees from top to bottom and there is also easy access to the neighbouring Bad Gastein skiing via the connections at the Angertal. 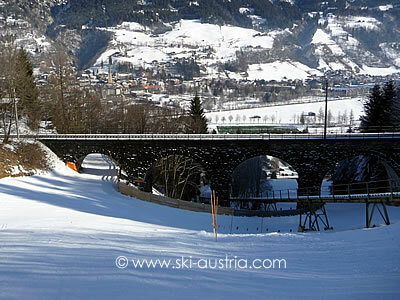 Bad Hofgastein's ski area is on the other side of the main valley road and reached by an underpass from from the village. Unusually, the initial ascent into the area is not by cable car or gondola but by funicular railway. The first stage of the Schlossalmbahn, the mountain railway, rises to the Kitzstein. Skiers have a choice here of stepping outside the building and onto the Haitzingalm chairlift and into the main area above the village, or staying inside (as most do) and onto the cable car which rises to the Schlossalm at just over 2000m. 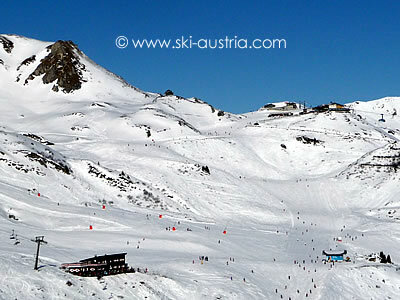 The slopes directly under the cable car and nearby are wide open intermediate runs with a range of chairlifts serving them: the Haitzingalm, as mentioned above; the Sendleiten; and the Kleine Scharte. The last two runs from near the top of the Haitzingalm chair. 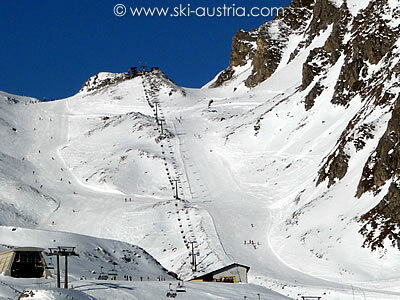 The Kleine Scharte chairlift also provides access to the Kleine Scharte red run, which is part of the lengthy top-to-bottom intermediate run. The top of the whole run is reached via the Weitmoser and Hohe Scharte chairlifts a little further over in the area above the Hamburger Skihütte. This spectacular run on the other side of the Hohe Scharte heads from 2300m all the way through to the village at 857m at an enjoyable red standard the whole way and with some lovely views to enjoy during the descent. In fact, at one point just above the village, skiers cross underneath both the mountain railway and the main Austrian railways line through to the southern part of the country. 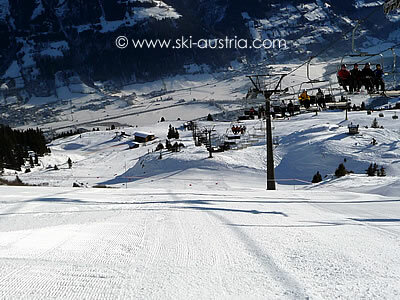 Skiers can of course head back down under the Hohe Scharte chairlift with a choice of two steepish but unchallenging red runs and then join onto blue runs to head over to the Angertal side of the mountain and the connection to the Bad Gastein skiing. An alternate way onto this side is the Schlosshochalm drag lift which provides access to the top of the red run down into the Angertal valley. The runs on this side, blue and red, are sunny, although the red might be a little steep for more timid intermediate skiers. There is a small beginners' ski area at the collection of lifts in the Angertal Ski Centre. Returning from the Bad Gastein side is by means of the Kasereben gondola. 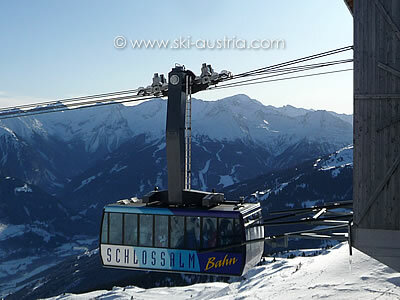 In good conditions, it is possible to ski from the top of this lift all the way through to Bad Hofgastein. Looking for the best accommodation in Bad Hofgastein? The live webcam stream below is taken from the Schlossalm area - other Gastein valley webcams are available by clicking the middle button above the live stream.